http://www.crcnapa.org/wp-content/uploads/2019/03/Thank-you-for-the-recognition-2.png 450 810 Eva Simonsson http://crcnapa.org/crc/wp-content/uploads/2018/01/Logo.png Eva Simonsson2019-03-16 16:53:122019-03-24 10:01:37CRC receives 2018 Achievement in Nonprofit Excellence Award! 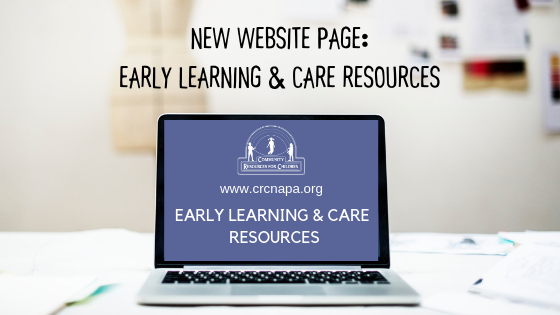 Check out our new early learning & care resource page! http://www.crcnapa.org/wp-content/uploads/2019/02/New-Early-Learning-Resources-on-our-website-1.png 315 560 Eva Simonsson http://crcnapa.org/crc/wp-content/uploads/2018/01/Logo.png Eva Simonsson2019-02-26 13:37:232019-02-26 13:38:14Check out our new early learning & care resource page! Active Minds Explores the Deep Oceans! http://www.crcnapa.org/wp-content/uploads/2019/02/IMG_20190221_104002126.jpg 3264 2448 Eva Simonsson http://crcnapa.org/crc/wp-content/uploads/2018/01/Logo.png Eva Simonsson2019-02-21 16:46:472019-03-06 14:33:25Active Minds Explores the Deep Oceans! Únase a nosotros para aprender sobre la importancia de hablar, leer y cantar con su hijo pequeño. Participe en canciones bilingües, rimas, cuentos, juegos de títeres y proyectos creativos. Edades para el grupo: niños de 0 a 5 años y sus cuidadores. Adecuado para: Familias, cuidadores y proveedores de cuidado infantil con un enfoque especial en proveedores informales como abuelos, tíos, hermanos, niñeras, vecinos y amigos. Tipo de clase: Abierta (no se requiere inscripción previa) se requiere la participación del cuidador. Suitable for: families, caregivers and child care providers with a special focus on supporting informal providers such as grandparents, aunts, uncles, siblings, nannies, neighbors and friends. Class type: Drop-in (no need to pre-register).Caregiver participation is required. Please join us for a Hot Topic Conversation! Please join Community Resources for Children for this one of a kind conversation with special guest Anne Sutkowi-Hemstreet (First 5 Napa and Weathervane Consulting). Anne has a Master of Public Health from UCLA with specializations in behavioral sciences and health education/health promotion. She has many years of experience providing parent education around body image and media literacy. She also has a personal interest in the screen time discussion now that she’s navigating the screen scene with her toddler and another on the way. Share ideas about healthy approaches to screen time for families. Seating is limited for this event, so please register today. Spanish interpretation will be available, and refreshments will be provided. Please call (707) 253-0376 x101 for more information. Por favor acompañe a Community Resources for Children durante una conversación única con la invitada especial Anne Sutkowi-Hemstreet (First 5 Napa and Weathervane Consulting). Anne cuenta con una Maestría en Salud Pública de UCLA con especializaciones en ciencias del comportamiento y educación para la salud / promoción de la salud. Ella tiene varios años de experiencia educando a padres sobre la imagen corporal y la enseñando el efecto de los medios de comunicación. Ahora que Anne es madre de un hijo pequeño y tiene otro en camino y está navegando por la escena de la pantalla con su hijo, ella tiene un interés personal en la discusión sobre el tiempo de la pantalla. Compartaideas sobre enfoques saludables para el tiempo de pantalla para las familias. http://www.crcnapa.org/wp-content/uploads/2019/01/HTC-Screen-Scene-FB-Event-cover-2.png 512 1024 Eva Simonsson http://crcnapa.org/crc/wp-content/uploads/2018/01/Logo.png Eva Simonsson2019-01-09 16:55:362019-01-09 17:00:25Please join us for a Hot Topic Conversation! Happy New Year! THANK YOU all for your support this Giving Season! With your help, we reached our goal of $10,000+ raised for school readiness program enrollment for underserved families and early learning supplies for economically disadvantaged children. Your donation through the Napa Valley Give Guide was doubled thanks to our generous Board of Directors! Thanks to you more children will be able to reach for the stars this year! http://www.crcnapa.org/wp-content/uploads/2019/01/WEbsiteHNY.png 315 828 Eva Simonsson http://crcnapa.org/crc/wp-content/uploads/2018/01/Logo.png Eva Simonsson2019-01-01 07:39:092019-01-02 09:09:46Happy New Year! More than 60 donors, supporters, partners, families, child care providers, volunteers, current and former board members, and community members attended Thanks-4-Giving, Community Resources for Children’s 40th Anniversary Celebration in the Toy Library and Early Learning Center on November 28th, 2018. The appreciation event was also a reunion for former staff, board members and community members working in the field of early learning. Carole Kent, the founding board member of Community Resources for Children (CRC) was honored and acknowledged for being a pioneer in emphasizing the importance of “quality” child care 40 years ago, a vision that helps guide CRC to this day. Former Executive Director, Diana Short, was honored for her 20 years of leading the organization, and Leslie Gevurtz, current Board Chair, was honored for her commitment, dedication and contributions to CRC. Finally, Senator Bill Dodd thanked CRC for 40 years of outstanding service by presenting a resolution co-signed by Assemblymember Cecilia Aguiar-Curry. A representative from Congressman Mike Thompson’s office presented a Congressional Record Statement in honor of the 40th Anniversary. Almost $10,000 was raised from event sponsors and donors for school readiness and parent-child engagement programs in the Toy Library and Early Learning Center. Join us for CRC ‘s 40th Anniversary Celebration! http://www.crcnapa.org/wp-content/uploads/2018/11/Thanks4Giving-Website-post.png 530 1033 Eva Simonsson http://crcnapa.org/crc/wp-content/uploads/2018/01/Logo.png Eva Simonsson2018-11-26 12:19:402018-11-26 12:25:12Join us for CRC 's 40th Anniversary Celebration!